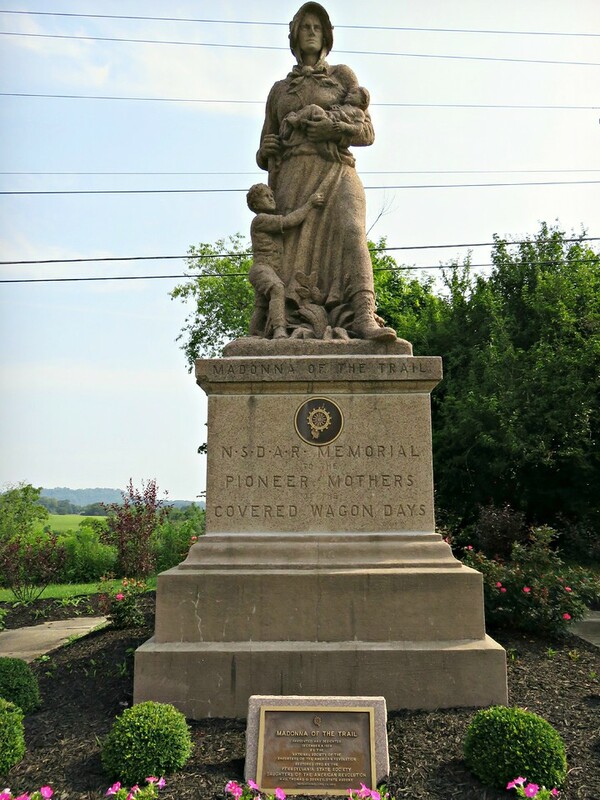 Roadside Stop: Madonna of the Trail, Beallsville, Pa.
During my Pennsylvania rambling road trip to nowhere, I ping-ponged around the state visiting things that I’d long wanted to see but had never made time to. One of those stops was to visit my first Madonna of the Trail on US40 in Beallsville, Pa.
Just look at this lady. One kid on the hip, another bawling and snot-nosed tugging on her too long, too hot, too annoying skirt. All the while dragging a rifle (no doubt to shoot a rabid bear) all while keeping her trap shut with the patience of a saint – while her husband drives their covered wagon 30 miles in the wrong direction because he won’t stop to ask for directions. What mom hasn’t been there? I raise my glass to the pioneer mother Madonnas. Cheers, ladies. We still feel you. Moms deserve more respect and monuments like this, for the reasons you describe.